Don't use your hands - this is better! Let this tool pick up crumbs and other small particles from your table and counter. Features 3 rotating brushes to effortlessly clean up any counter or table top mess! 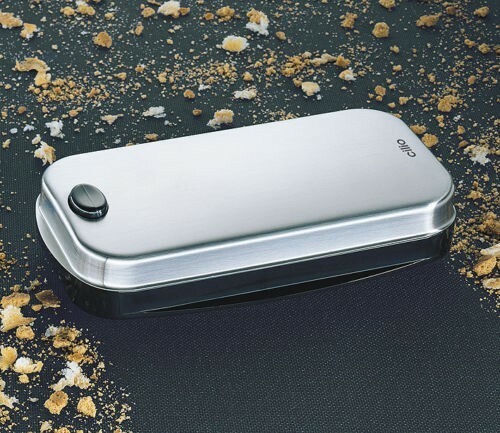 The Matte finish 18/10 stainless steel cover easily lifts off to empty. 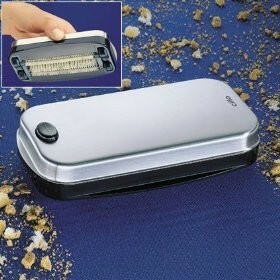 Cilio Table Crumb Remover 305005 swiftly picks up crumbs and other small particles from your table and counter. 3 rotating brushes underneath a matte finish 18/10 stainless steel cover.